Thomas Worthington was an early Midwestern political leader and the sixth governor of Ohio. Worthington was born on July 16, 1773, near Charles Town, Virginia (modern-day West Virginia). His father died while Worthington was a child, and his elder brothers raised him. At the age of eighteen, Worthington spent two years in the merchant marine. He returned to Virginia in 1793 and began to study surveying. In 1796, he assisted Duncan McArthur in surveying the Virginia Military District. He received payment in land and decided to move from Virginia to his land near Chillicothe, Ohio. Edward Tiffin, his brother-in-law, accompanied him. Before leaving Virginia, the two men freed their slaves. These men were both members of the Methodist Church and were opposed to slavery because of their religious beliefs. Several of these now free African-American men accompanied their former owners to the Northwest Territory. Upon arriving in the Northwest Territory, Worthington built his home, Adena, near Chillicothe. Benjamin Latrobe, the architect of several government buildings in Washington, DC, designed the home. Adena was one of the finest early homes in Ohio. Worthington and Tiffin quickly emerged as political leaders in the Northwest Territory. From 1799 to 1803, Worthington served in the territorial legislature. A committed member of the Democratic-Republican Party, Worthington became a major opponent of Governor Arthur St. Clair and the Federalist Party. St. Clair actively opposed Ohio's admittance to the United States. He hoped that Ohio would not become a single state but rather two states. If this occurred, St. Clair believed that the Federalists would outnumber the Democratic-Republicans, and the Federalists would continue to control the government. Democratic-Republicans opposed St. Clair's efforts. Worthington, Tiffin, Nathaniel Massie, Michael Baldwin, and several others urged President Thomas Jefferson, to make Ohio a state. Worthington personally traveled to Washington, D.C. to urge Ohio statehood. Jefferson responded by approving the Enabling Act of 1802. This act called on the people of Ohio to form a constitutional convention and to fulfill the other requirements of the Northwest Ordinance to become a state. St. Clair denounced the Enabling Act, prompting Jefferson to remove St. Clair as territorial governor. Ohio became the seventeenth state of the United States in 1803. Worthington served in the Ohio General Assembly briefly in 1803 but became one of Ohio's first two United States Senators in that same year. He served as a senator until 1807. He then became a member of the Ohio General Assembly for the next two years. In 1810, he returned to the United States Senate. While in the Senate, Worthington urged the United States government to send military assistance to the settlers of Ohio to aid them against the Indian forces of Tecumseh and the Prophet. He also believed that the United States was too weak to defend itself adequately against the British and opposed the War of 1812. He resigned his senate seat in December 1814 to become governor of Ohio. He was reelected governor in 1816. As governor, Worthington advocated numerous social reforms, including the regulation of bars and taverns, state assistance to paupers, and prison reform. He also became one of the earliest advocates for a canal system and supported free public education in the state. Unfortunately for Worthington, the Ohio legislature refused to enact most of his proposals. However, by the mid to late 1820s, many of Worthington's ideas, such as canals and public education, had become realities in Ohio. 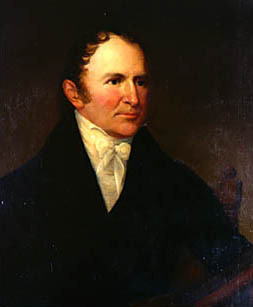 After his second term as governor, Worthington remained active in public life and served two more terms in the Ohio legislature during the early 1820s. He died on June 20, 1827. Kalette, Linda Elise. The Papers of Thirteen Early Ohio Political Leaders: An Inventory to the 1976-77 Microfilm Editions. N.p. : N.p., 1977. Sears, Alfred Byron. Thomas Worthington: Father of Ohio Statehood. Columbus: The Ohio State University Press, 1958.